I keep thinking to myself that I should write a post about Halloween this year before I forget what it was like, and I've finally decided to do it before the end of November since I was supposed to write fifty thousand words this month anyway! 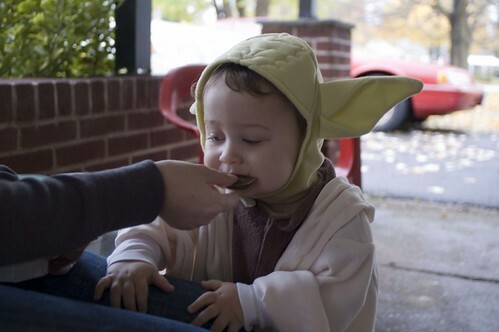 This year, about one week prior to Halloween, we decided on the costume of Yoda for Nathan. I really held off on buying a costume this year, but, luckily for Nathan, it didn't hurt his Halloween enjoyment. I also bought him a little plastic pumpkin even though I believed we'd only go to one house to trick or treat since Nathan is still so small! After Paul got home, we quickly got his dressed in his costume and we gathered all of our bags of candy and stuck the candy in the car. We also put a few of his Thomas the Tank Engine trains in his pumpkin to ensure that he would not drop the plastic pumpkin. 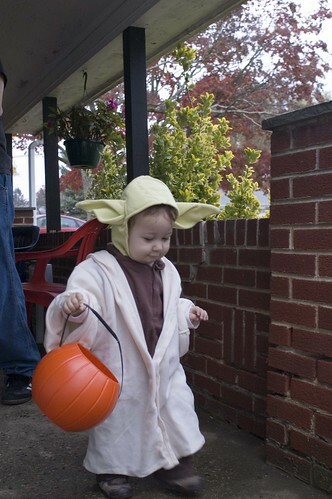 Nathan went next door to our neighbors, Walt and Dot, and he successfully completed a trick or treat, though he was awfully shy about the whole thing and unappreciative of his Jedi sleeves. To help him like the whole thing a lot more, we went back to their porch, sat down for a short bit (since it was still about four in the afternoon), and let him eat his treated goodies. I later heard from Dot that her husband, Walt, told all the visiting parents about Nathan. They treat Nathaniel, as they call him, like an honorary grandchild. I should make them some baked goods for being sweet to him! I like people who like Nathan. After this, we packed the little man into the car and drove to his actual grandparents (ie, Paul's parents) for more tricking and treating. Nathan had kind of grabbed the idea of what was going on by now and was more confident in his tricking and treating. After returning to my mom's home, my mom and I gave out candy to the hordes of children that attacked her house. No lie, we gave out about five bags of candy and we closed out early. By the third bag of candy, Nathan had figured out what was going on with the knocking children, and he started to pick up candy and give it out! I had no idea he knew what was happening until I saw him drop a candy bar into a little girl's treat bag. It was the best. 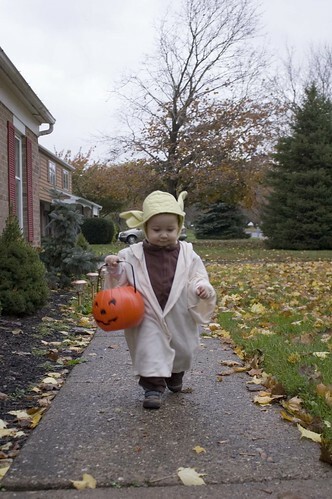 After that, he gave out candy instead of us, which elicited a lot of "How cute!" 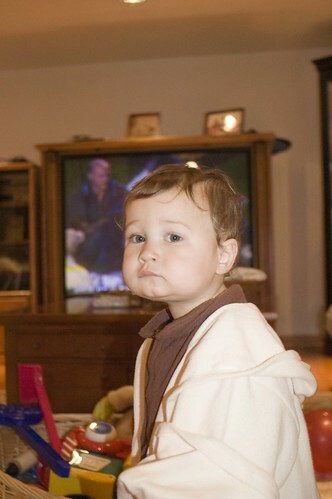 After everything was done, we all relaxed with some burgers, and Nathan practiced his Jedi mind tricks on us. "This is not the baby you're looking for!"